The F1 India GP buzz took some time to pick up this year, but with the race weekend coming up in less than a week, brands are increasingly leveraging their association with the sport. Vodafone executed a slick home page takeover on Yahoo! India today for its F1 Super Fan campaign. The rich media was nicely done with a hint of interactivity, where the user is asked to plug a Vodafone 3G dongle into the race car, post which the car zips through various Yahoo! sub channels creating visual interest. Check out the video below. 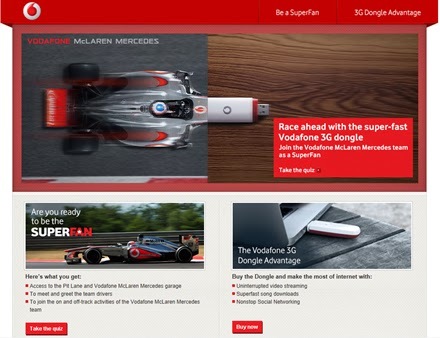 Vodafone is using the McLaren Mercedes association by promoting its 3G USB stick with ‘superfast internet access’ communication, which is a great fit. Super Fans get to experience F1 up-close with access to the Pit Lane & Vodafone McLaren Mercedes garage in addition to meet & greet with the team drivers. In a smart move, the brand is only allowing their 3G dongle buyers to participate in the contest. Participants need to answer 4 questions in good time on the promo microsite to stand a chance to win the Super Fan title. You may remember that Vodafone used the Super Fan campaign first for IPL 2013. Check out F1 related digital brand activations from 2012 here.